Suiting up for 400 NHL regular-season games usually is not a big deal for a top-five draft pick, but Thomas Hickey is a unique case study, and the fact he played in his 400th game is a tribute to his perseverance. Suiting up for 400 NHL regular-season games is usually not a big deal for a top-five draft pick. But New York Islanders defenceman, Thomas Hickey, is a unique case study and the fact he played in his 400th game is a tribute to his perseverance. The 29-year-old Hickey, who reached the milestone when the Islanders and Pittsburgh Penguins met on Tuesday, was a can’t-miss prospect when the Los Angeles Kings selected him fourth overall at the 2007 NHL Entry Draft in Columbus. He went on to win back-to-back gold medals with Canada at the 2008 and 2009 World Junior tournaments and was a Western Hockey League all-star in his final two seasons with the Seattle Thunderbirds. But ankle and shoulder injuries limited Hickey to just 19 regular-season games in his first full season of pro with the 2009-10 AHL Manchester Monarchs. When he was beginning to find his way, the Kings had already built an accomplished blue line and there was no room for Hickey on the roster. “It certainly has been an uphill climb,” Hickey said. “I went from being a high draft pick to a player trying to make it in the league. That’s the way I approached it. Hickey played well enough in 2011-12 to earn a promotion to the Kings in the playoffs. He was one of 10 Black Aces who practiced and travelled with the Kings to stay ready in case of injuries. But he did not play. Still, it was quite the learning experience. He was looking forward to training camp in the fall, but he could not make an impression with the defending champs right away because of the owners' lockout shortened 2012-13 season. The lockout, however, was a blessing in disguise for Hickey. With all the NHL general managers, team executives and scouts zeroed in on the AHL more than usual, Hickey was provided with an opportunity to be showcased. He already had considered this a make-or-break season and didn’t disappoint. He performed well and was an automatic invite to the Kings' abbreviated training camp that January. But Hickey was disappointed once again, and he was returned to Manchester before the season. Only this time, because he was now a third-year pro, had to clear waivers. "I was back in Manchester, preparing to play a game that night," Hickey said. "I was hoping at noon to find out that another team picked me up. But I didn't hear anything right away." Then his phone rang. His agent Kevin Epp was on the other end. 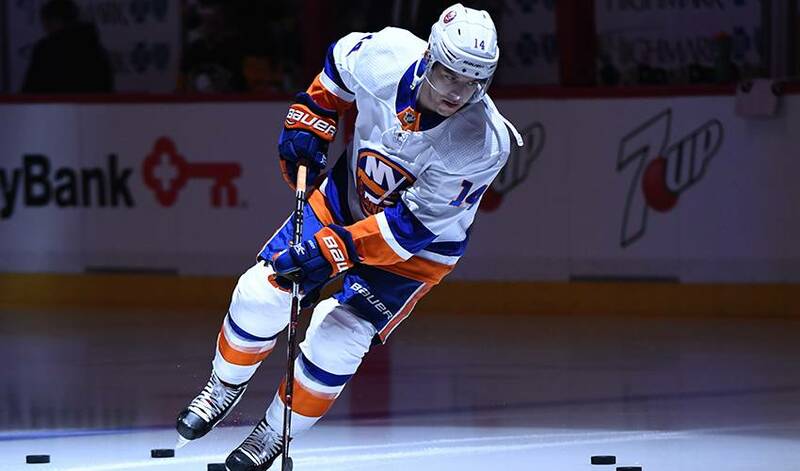 Epp delivered the news – the Islanders, in desperate need for some depth on defence, had picked up Hickey off waivers. "I was thankful for the opportunity," said Hickey, who played 194 AHL regular season and playoff games before his first NHL debut. But Hickey, at first, found himself in a familiar situation. He sat on the sidelines for the first four games with the Islanders. Then, with his new team visiting the Winnipeg Jets on Jan. 27, 2013, his opportunity finally arrived. Hickey's older brother Daniel, mother Roberta, and father Denis scrambled to book plane tickets on the day of the game. But there was bad news. There were only two seats available on the last flight from Calgary to Winnipeg to make it to the game in time for Hickey's NHL debut. His father was left behind. Instead, he booked a trip east three weeks later to follow the Islanders to Ottawa and Montreal. It was worth the wait because Denis was there to witness live Thomas scoring his first NHL goal to beat the Canadiens in overtime in his 10th career game. His father often played goal in the family basement when Thomas and Daniel took shots on him when they were younger. "It was special he was there to see it," Hickey said of Denis. It’s still special 390 games later.